President Trump said Sunday that California is “out of control” over sanctuary cities and threatened to cut funds. “If we have to, we’ll defund. We give tremendous amounts of money to California. California in many ways is out of control,” Trump said. 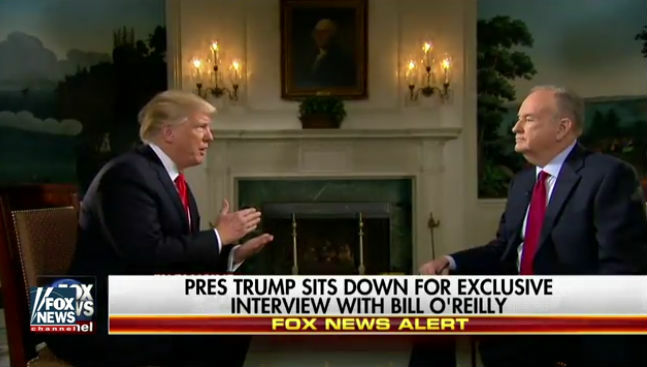 The president’s comments came in an interview with Bill O’Reilly of Fox News during a Super Bowl pregame show. In many California cities, though not officially San Diego, local police do not turn over undocumented immigrants to federal authorities. The intent is to get the immigrant community’s help in preventing other crimes. The state Senate is considering a bill that would prohibit state and local law enforcement agencies from using officers or jails to uphold federal immigration laws, making California a sanctuary state. On Mexico, Trump said that he offered President Enrique Peña Nieto American help to fight the drug cartels. “I love the people. I really like this administration. I think he’s a good man. We get along very well. But they have problems controlling aspects of their country,” Trump said.